Minister for Arts, Heritage and the Gaeltacht, Heather Humphreys, visiting the Luan Gallery, Athlone recently. Pictured l to r: Carmel Duffy, manager Athlone Arts & Tourism; Deputy James Bannon; Deputy Gabrielle McFadden; Minister Heather Humphreys; and Joe Grennan, Athlone Arts & Tourism. 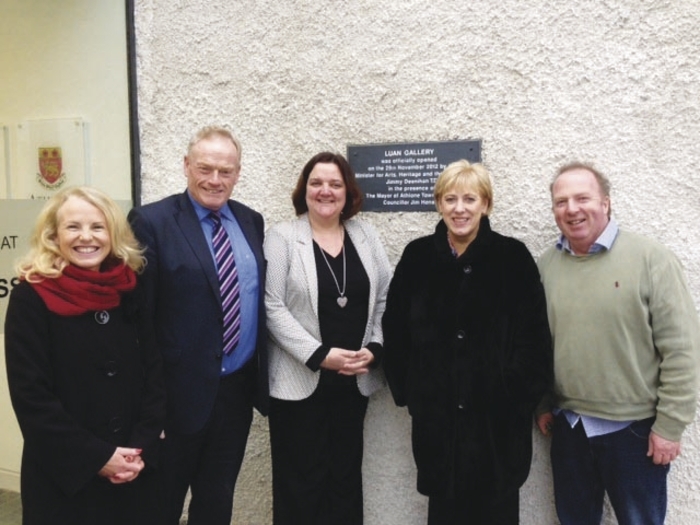 Minister for Arts, Heritage and the Gaeltacht, Heather Humphreys, paid a visit to the historic Marconi transmitter at Moydrum during a visit to Athlone recently. “I’m delighted that Minister Humphreys made time out of her busy schedule to see some of the great work that is going on locally to promote tourism in Athlone,” said local TD, Gabrielle McFadden. “The Marconi transmitter is central to an exciting project aimed at establishing an interactive visitor and educational centre in Athlone on the history of broadcasting in Ireland. During her time in Athlone, Minister Humphries met members of the group in Moydrum to hear of their plans and also took in visits of the new John Count McCormack exhibition at Athlone Castle and the Luan Gallery.